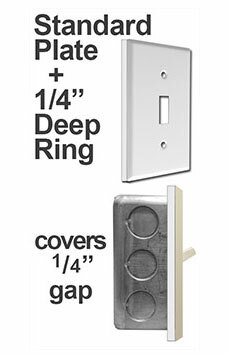 Get a finished look with wall plate depth extender rings that hide edges on protruding electrical boxes and fix gaps caused by electrical devices with bulky wiring. Stack these 1/8" acrylic spacer gaskets to cover deeper gaps - 1/4", 3/8", 1/2", etc. - to create extra deep wall plates. 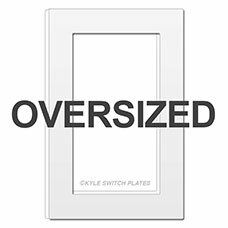 Use these hard plastic spacers behind standard and oversized light switch outlet covers to get a finished look under wallplate edges. 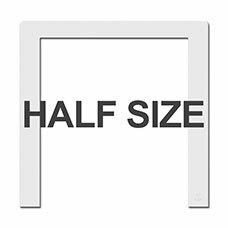 Hide the edges of exposed electrical boxes in shallow external walls where you can't use a standard depth wall box. Use under wall plates after removing paneling that reveals the sides of wall boxes. 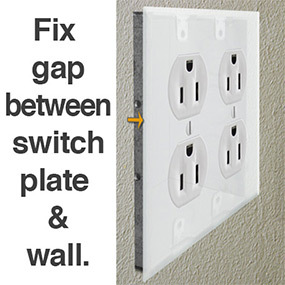 Fix gaps caused by mismatched drywall thickness and electrical box depth. 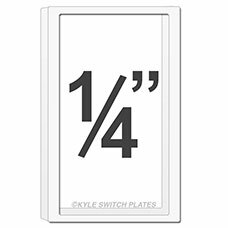 Create a square edge on totally flat stone, forged metal, mirrored acrylic, or glass light switch covers to get a better fit. 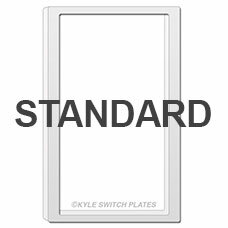 Wall plates cut from these solid materials typically are completely flat with no recessed area on the back nor beveling along the edges. Adding a depth ring will keep out dust and dirt. 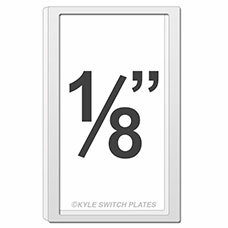 Problem: There's a gap between your switch plate cover and the wall. Your electrical box might not sit flush with the wall surface. 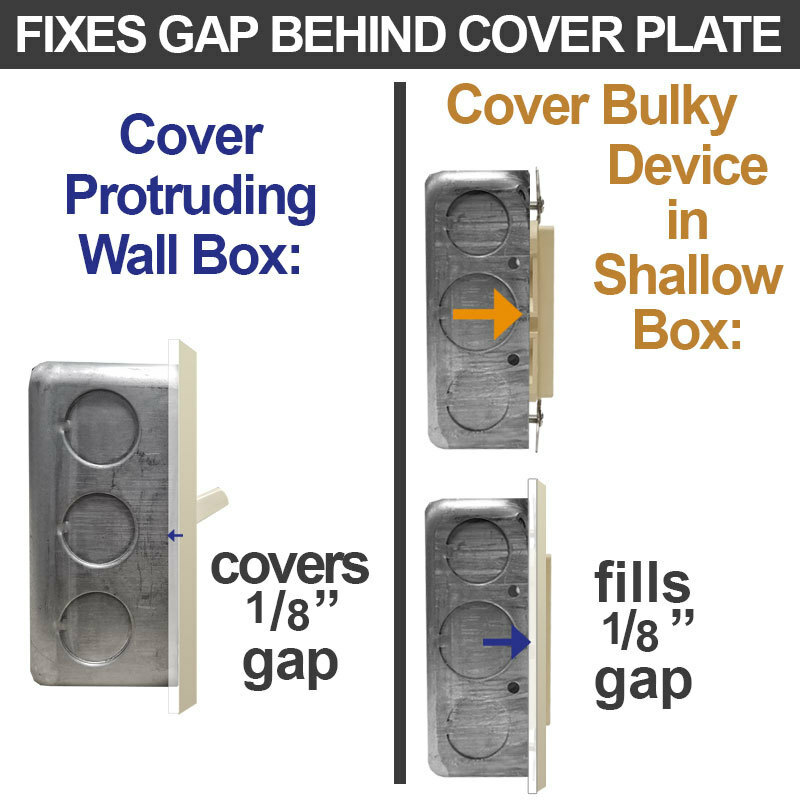 When boxes protrude out of the wall, there will be a gap between the plate & the wall once the plate is installed. This happens when you remove wall paneling or tile that the box was pulled forward to sit flush with. 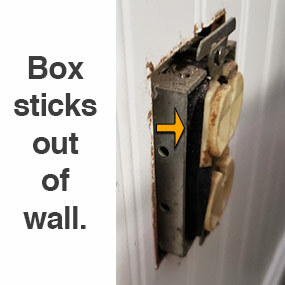 Solution: Buy deep plates (with a deeper edge bevel) that reach back farther around the box's protruding edges. Or, stack depth filler rings (sold above) underneath your standard cover. You may have replaced an old device (such as an electrical outlet) with a newer, bulkier one (like a GFCI outlet). 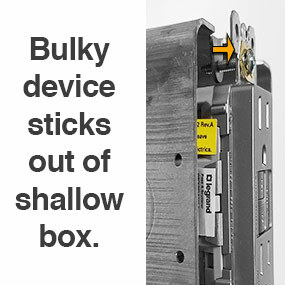 If your electrical box is too shallow to accommodate the bulkier device, it will stick out. Solution: Put spacers under the device, then use deeper plates or stack depth rings under standard plates. 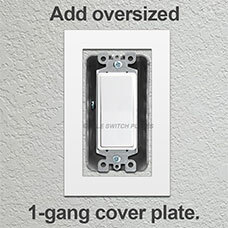 Fix small 1/8" gaps underneath your switch plate or outlet cover. Extra deep rings fill 1/4" gaps. Rings can be stacked for larger sized gaps. 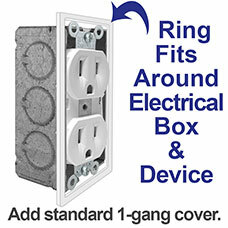 These depth rings sit behind standard size cover plates (2-3/4"W x 4-1/2"H for 1-gang). Add standard sized covers right over the gap fillers. Half size rings fill gaps that are only under half of your plate. Get half sized rings for single gang plates. Shop half rings for double-gang covers. When your wall tile ends mid-way up your light switch cover, a half sized filler can do the trick. 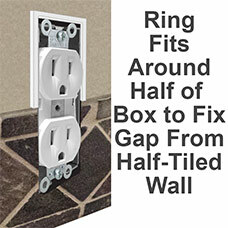 To prevent the outlet from being "sunken" down in the cover, be sure to stack spacers underneath the receptacle to pull it up to sit flush with the tile and filler ring. 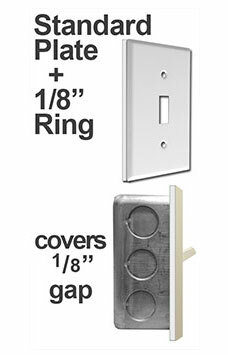 Oversized rings can be used under oversized switch plates (3-1/2"W x 5-1/2"H for single gang). If you have an oversized plate with a gap underneath, you'll want to get the oversized rings as a solution.